Sorry... the 2016 BMW 428 Gran Coupe is no longer being sold as new. 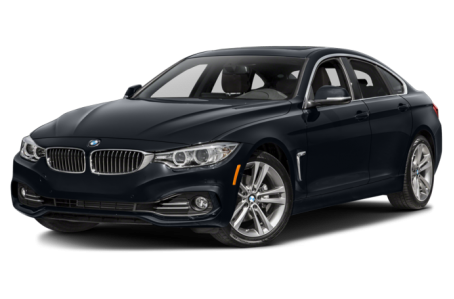 The 2016 BMW 428i Gran Coupe is the luxurious, four-door sedan of the 4 Series lineup. It offers the versatility of a hatchback with the style of a luxury sedan. Last year’s Sport Line Package, which included gloss black exterior accents, sport seats, a leather-wrapped sport steering wheel, and sport instrument cluster are now standard. The 428i Gran Coupe competes with the Audi A5 and Mercedes-Benz C-Class. Two trims are available: the Gran Coupe and Gran Coupe xDrive. At first glance, the 428i Gran Coupe is styled similar to other beautiful BMW sport sedans. It features aggressive, dagger-shaped headlights, sleek bodylines, and vents at the front-quarter panels to help release heat from the brakes. Upon closer inspection, one finds that the sedan also has a unique, rear liftgate, which makes loading and unloading more convenient. Standard features includes Xenon headlights, fog lights, power-folding and heated side mirrors, and 18-inch wheels. The available Track Handling Package includes variable sport steering, M Sport Brakes, Adaptive M Suspension, and unique 18-inch wheels. Aerodynamic body styling, adaptive suspension, full LED lights, automatic high beams, and larger 19-inch wheels are available as well. Powering the 428i Gran Coupe is a standard 240-hp, twin turbocharged 2.0-liter 4-cylinder engine mated to an 8-speed automatic transmission and rear- (RWD) or all-wheel drive (AWD). A 6-speed manual transmission is available at no extra cost with a RWD. Inside, the 428i Gran Coupe features a driver-centric interior with a beautiful wood trim. Protruding above the center console is the standard iDrive multimedia system. It has a 6.5-inch touchscreen with controls for phone, audio, radio, navigation, and other information. When the rear seat is folded down, the 428i Gran Coupe offers a generous 45.9 cubic feet of storage space. A tilt/telescoping steering wheel, power-adjustable seats, dual-zone climate control, Bluetooth connectivity for phone and audio, and a USB port come standard. Optional features include leather upholstery, heated seats and steering wheel, an integrated navigation system, and a Harmon Kardon premium audio system. Standard safety features include front airbags, antilock brakes, and an electronic stability system. Front and rear parking sensors, surround view cameras, a blind spot warning system, and lane departure warning are available as well. 6 of 6 (100%) consumers said they would recommend this vehicle to a friend.